the sound of music . . . This post is not about the movie, the play or the book, “Sound of Music.” What it is about is what happens to the human spirit when the sound of music is heard live, in person, in the presence of the music being made, heard and then falling away. A few days ago, I received an email from some old friends of mine with whom we had lost touch. We would say we would get together soon but somehow never managed to. You know how that goes. In any case, they wrote to me to ask a favor. A neighbor of theirs was planning to celebrate an 88th birthday for their father who was visiting them from out of town. It turns out that 88 is also a magic number for the number of black and white keys on a piano keyboard. The birthday celebrant loved classical piano music, and my friends wondered whether I would play some pieces for him as his “birthday gift.” They also wanted to make a gift of some sort made out of old piano keys, which G., my husband who is a piano restorer, brought over to their house yesterday to play around with. In the meantime, we had to hustle because it turns out that the favorite piece of this classical music lover was Rachmaninoff’s “Rhapsody on a Theme by Paganini.” If you are familiar with it, you’ll laugh out loud like I did because: a) it’s very difficult; and b )it’s written for piano and orchestra. Undaunted, G. found a reduction (simplified) version of the score at the Holy Cross music library aided by a piano friend who is on the faculty there. Even with the score easier to see, it is still hard to read and play, given that it is written for five flats! This is Tuesday and I’ve put together a tentative program according to the Juilliard model (baroque/classical/romantic) in that order: Bach, Scarlatti, Chopin and Rachmaninoff. Practicing yesterday, I noticed that although I hadn’t played or practiced in quite awhile, that I felt both stronger and freer while going through the pieces. This afternoon, G. will tune the piano that hasn’t been serviced for awhile and meet the fellow who will be congratulated on Thursday evening, although he probably doesn’t have an inkling of all these surprises in store for his birthday. Thursday evening: The party was a hit! Chuck spoke about the first time he heard the Rachmaninoff Rhapsodie on a Theme of Paganini when he was twenty years old in a church during World War II. His relating the story after I played the piece brought the experience full circle–and so I did a reprise of it for him. When I asked him if there was any other piece he’d like to hear, he shook his head and said that he was happy with the program and with hearing the Rachmaninoff piece live. Now, there’s a rarity–someone who is satified and knows it. What a great treat to be able to play this music for him! I’m grateful for the invitation to participate. LOL! FIVE of either is a challenge! never mind playing two staffs (orchestra and piano) to get the melody through! Nice to hear from you! Bravo! It sounds like you brought a great deal of pleasure and artistry to a wonderful party and a fine fellow admirer of music. What a great way to celebrate! Thanks! It was sweet to see how much thoughtful and loving planning the hosts and their friends put into celebrating this fellow’s 88th birthday. It was refreshing to witness and a treat for both of us to be included. Was this recorded, Katherine? I would love to hear it. Could you list the other pieces that you played? Yes…it is really me, by the way. I do make an attempt to read your blog somewhat regularly. Hi Gale, nice to hear from you! 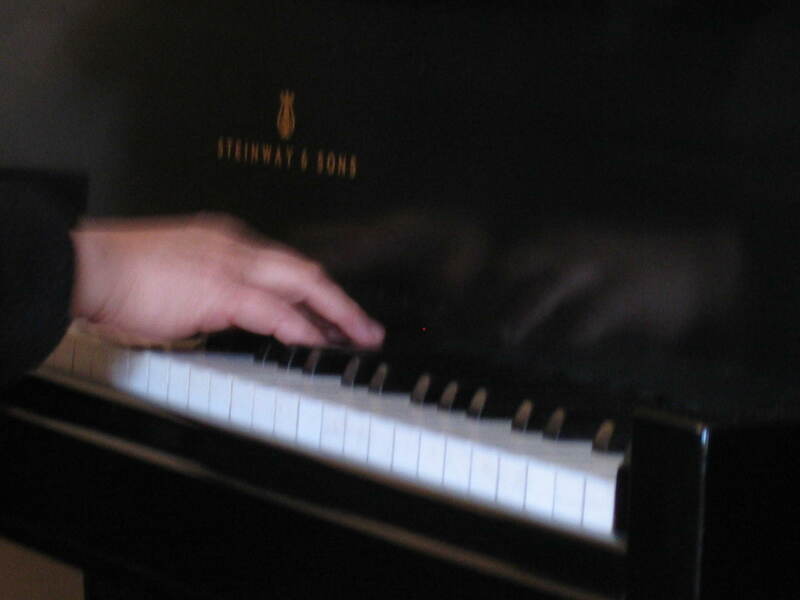 I played Bach Goldberg variation; Scarlatti sonata, Chopin preludes, Rachmaninoff 2nd Concerto. What are you playing these days on your wonderful piano? My mother-in-law, Barbara Payne Glick, was a concert pianist and a Julliard Fellow who loved Chopin…every time I hear any of his work I think of her with much love. Thanks for your comment, Karen. Live music evokes so many emotions. We should all play more often!